The Avantco C30 pourover coffee brewer is the affordable and durable solution to your coffee needs! Designed for easy use with simple push button operation, this coffee brewer features two lower warmers and one raised warmer so you can have multiple pots of hot coffee ready while another is brewing. Coffee is brewed at optimum temperatures between 201 and 205 degrees Fahrenheit, and its external stainless steel construction gives it a sleek appearance and makes it easy to clean. And to ensure you can keep up with busy hours, this compact brewer can produce up to 56 8 oz. cups of coffee per hour. The Avantco C30 pourover coffee brewer requires a 120V electrical connection. 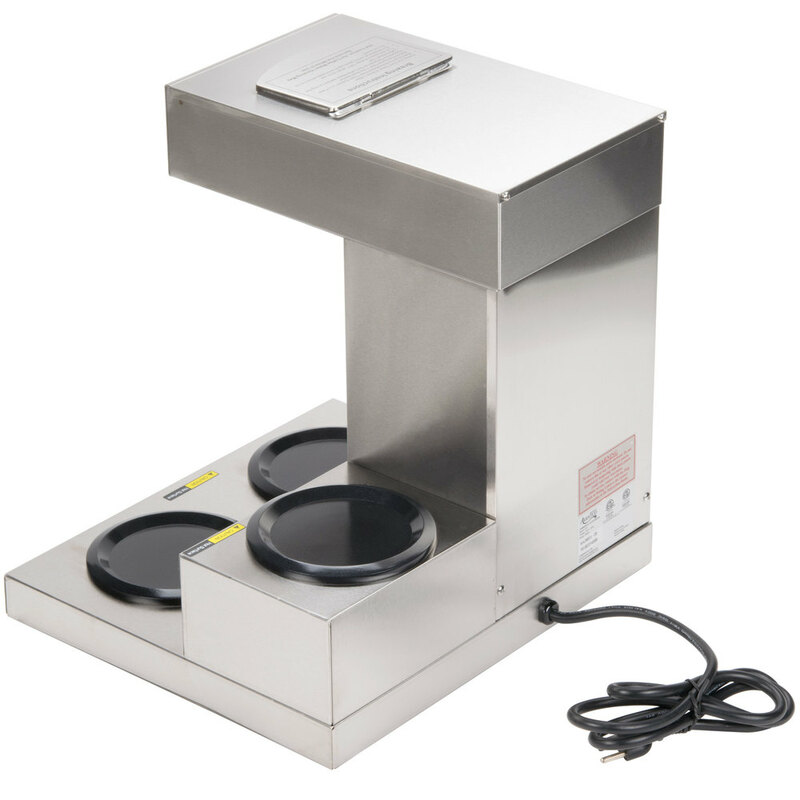 I just bought this for my small restaurant and was really happy. It keeps the coffee nice and hot on the warmers and brews fairly fast. I needed a simple Coffee Maker to supply my customers with coffee. This machine does the job. It's easy to make coffee. It's easy to clean, and the two extra warmers are great to have. For the price this machine is worth it. Excellent product. Great price.Perfect size for my small corner table in my restaurant.super easy to use and to connect it. i will recommend this product to my friends and family that owns business. Such a work-horse! It brews pot after pot without any problems. We've used ours non-stop for months and it works just as well as the day we bought it. We are really happy with this product. We have had it for about 2 years and still working like a champ, it has 3 warmer keeps the coffe really hot. We bought this product a few months ago. Two months after buying it, it began to leak. We called and after a few emails back and forth it was replace with a new unit. So far it is working good. Love it We love these coffee makers and so do our customers. Its one of the fastest selling items on our website. You won't be disappointed. i only use this item for a couple weeks and then it stop working, I contact costumer service and the coffeee maker company replace the item ... so far the new one has been working fine. 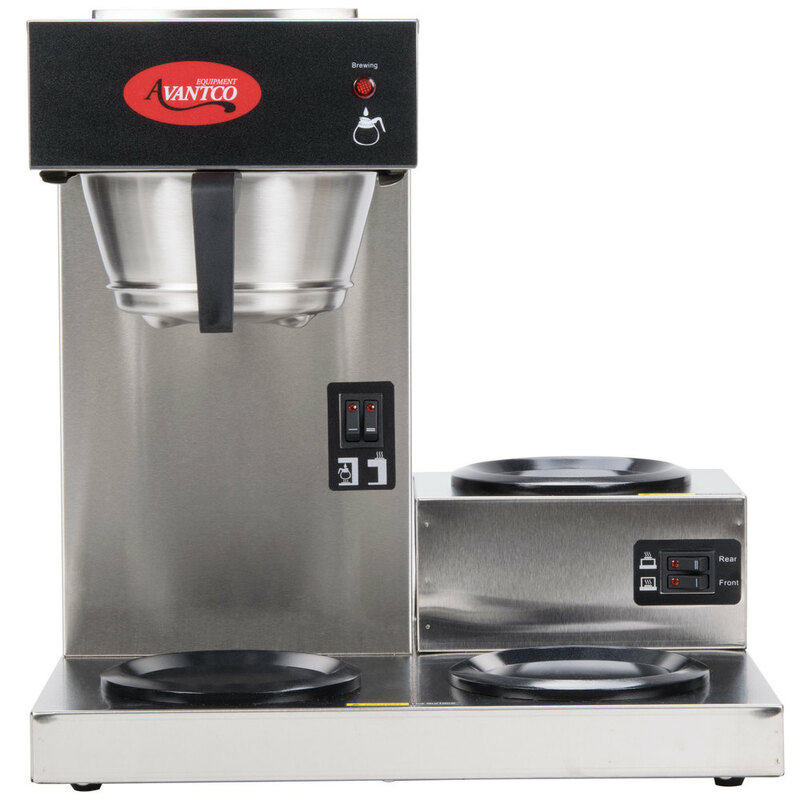 Avantco s, simple 3 warmer coffee maker. Does the job! Priced right. And makes plenty of coffee. Why get it from any place else, but webstaurant store! 4 stars. This coffee machine is AMAZING! We use it 24/7. We are a hostel and one of the free perks we offer our guests is coffee so we needed a machine that could handle it. Highly reccomment it! This item arrived and it was very light. I was expecting a heavier product but it is what it is. Seems ok. For the price, you really cannot beat it. I have no complaints so far. Great machine, especially for small kitchenette spaces low on counter space. Triple plates allow for easy group settings, but can also use one at a time for daily wants. This is a great durable product at an amazing price. It can handle heavy use no matter how much coffee you need to make and it makes coffee fast. Great product! 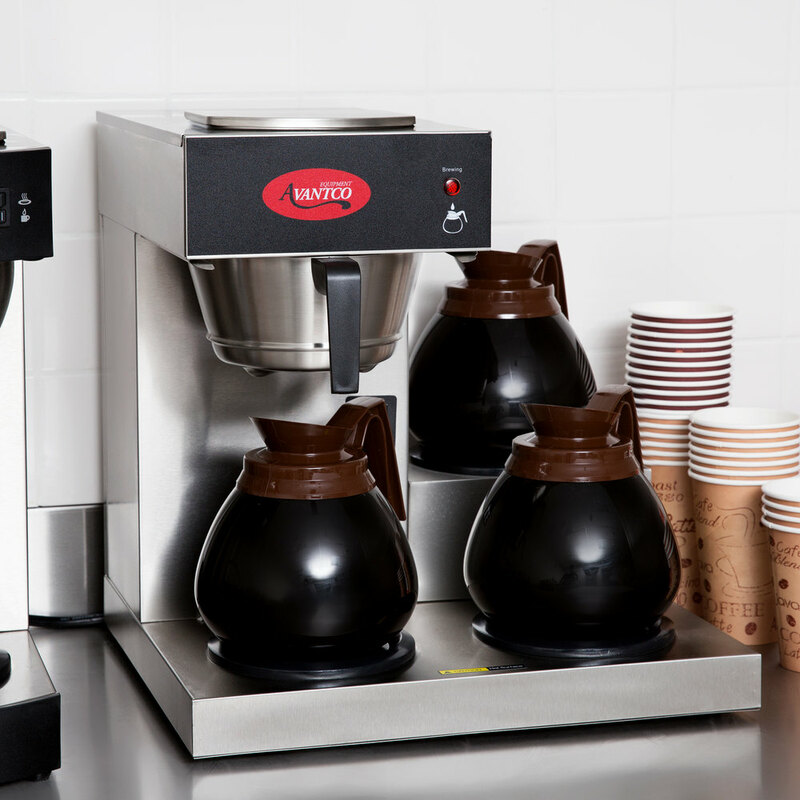 The Avantco C30 Pourover Commercial Coffee Maker with 3 Warmers keeps all of the coffee ready to go on an instant. 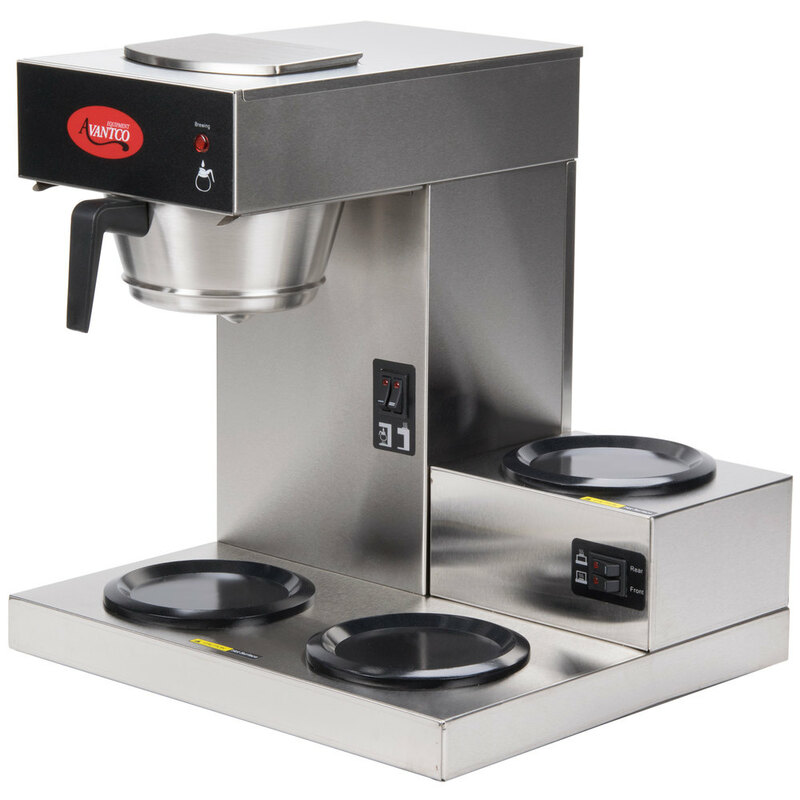 With 3 locations for coffee pots it only takes up a very small space which is great. We have very hard water so this machine didn't last very long, I feel if the water would have been different that the machine may have been good. This coffee maker is easy to operate, easy to clean and makes a fine cup off coffee. We've had no problems with keeping coffee hot on the warmers and the brew time is quick - no waiting. I would buy another. I've been in use of this coffee maker for several months and have had no issues. I did read a review about someone else's that stopped making hot coffee. I do not make a large quantity of coffee a day, but everything is working well so far. We are very happy with this model. It is a good size and good quality for the money. We would recommend this product to others. Looks great--neat all-over chrome--and functions well. You can't beat the price. Comes with a very sturdy basket and some filters too. We added a label for the power switch, because the graphic didn't seem clear. First Class coffee maker, and for the price,so much cheaper and better than the Bunn units I am changing out for my clients,well built and fast shipping! 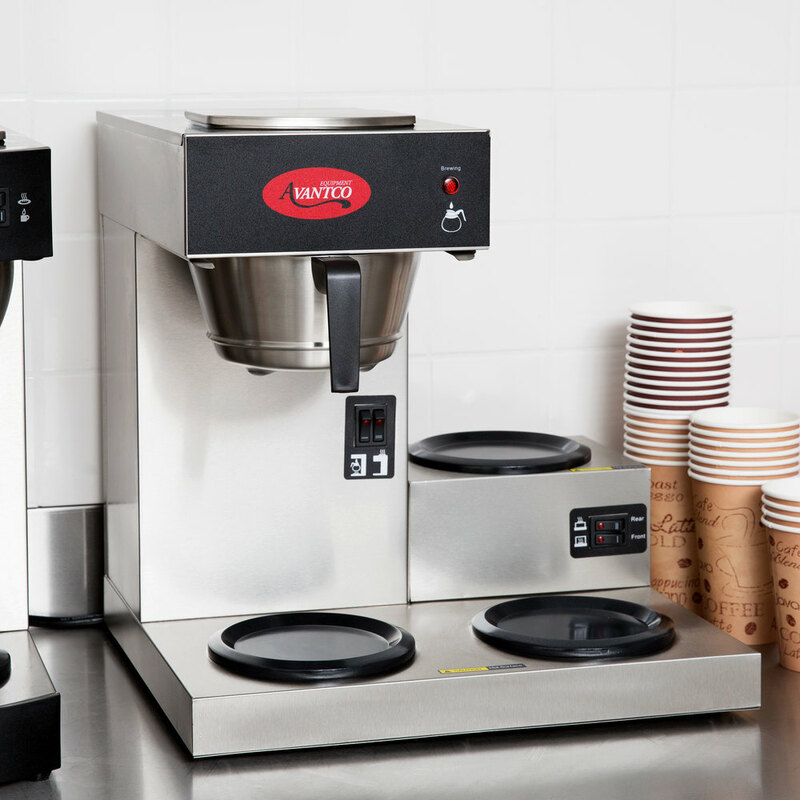 the Avantco C30 is a great product for any location that has a high demand for hot coffee brewed fast. Easy to clean and reliable. Great for dinners that go through coffee very quickly. Also a must have for any business that has employees that love coffee. This can hold 3 different types of coffee. This coffee brewer is great for diner settings. 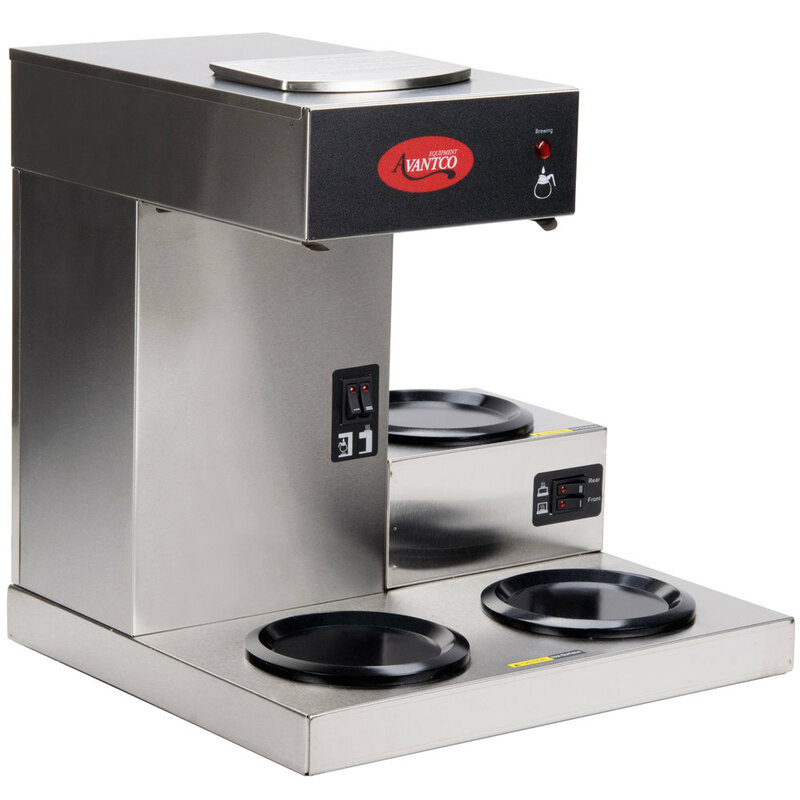 It can brew regular or decaf coffee and keep both warm so that a customer can be served right away.